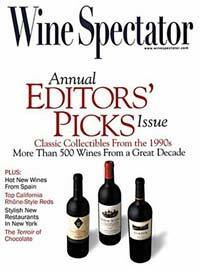 Wine Specator magazine is the number one source for people who love wine and the world of wine from grape to bottle to glass. Their wine ratings can make a wine an instant bestseller and clear the shelves at your local wine store, likewise their international restaurant reviews can make or break a restaurant. While the focus of the magazine is on the growing, production, history and enjoying of wine it also delves into those pleasures often associated with wine such as cooking, fine dining, entertaining, travel, culture and the arts. Big, bold and glossy and packed full of invaluable information for wine enthusiasts, the photographs in each issue of Wine Spectator are worthy of a fine art book.